We specialise in producing high quality ladder accessories for use in the home and trade. All our products comply with the appropriate British Standards, and you can therefore be assured of many years of safety and convenience for your customers for years to come. Burton Wire & Tube Co.Ltd. 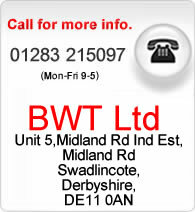 are a well established engineering and security products firm, based in Swadlincote, Derbyshire.